Delighted to be a Guest Artist in this eclectic show of 30 East Anglian Artists. This spring I have several exciting Exhibition Invitations to share with you plus the Book Launch of a new 'Herbal' I have been involved with. I would like to invite you to this years Florum Art Exhibition at its beautiful new venue at Goodnestone park Gardens. I will be showing work from the 'Rose' series plus a new watercolour completed this winter of Opium poppy capsules. Florum is a colourful, inspiring and uplifting exhibition showcasing some of the UK’s best botanical artists. Against a backdrop of Goodnestone’s gardens and with the additional attraction of the café’s delicious cakes, it should provide a real treat. Originally established by a group of professional botanical artists, it is an exhibition by invited artists all of whom are inspired by plantlife. The range of the show has broadened over the years and includes contemporary botanical works, freestyle flower paintings, landscapes with plant content and some semi-abstract pieces. There are original works in watercolour, oil paintings, textiles, etchings, wood engravings, coloured pencil and mixed media works and many more. Artists’ prints and cards will also be for sale. Between Friday 18th May and Friday 15th June 2018, ABBA , Association of British Botanical Artists, will present a juried exhibition of artworks of native plants, in association with the Ruskin Library and the Peter Scott Gallery at Lancaster University. This will form the United Kingdom’s contribution to the Botanical Art Worldwide exhibition held in 22 participating countries around the globe at the same time. A worldwide day of botanical art will be held on May 18th 2018, with events held for 24 hours, following the sun from venue to venue. The UK (excluding Scotland, which has its own exhibition), will have the main exhibition at the Peter Scott Gallery in good company with some of John Ruskin’s collection of drawings and prints. At the same time, The Shirley Sherwood Gallery at Kew Gardens will host botanical artists demonstrating their skills in recognition of all botanical art worldwide on this special day and an event will also take place at the RHS Lindley Library. A slide-show containing all the selected botanical artworks from each country together will run both at the Peter Scott Gallery, the Shirley Sherwood Gallery and the RHS Lindley Library at least on May 18th. Details of the participating countries can be found on the new Botanical Art Worldwide website hosted by the ASBA – American Society of Botanical Artists. I chose to paint Rosa rubiginosa, also known as Sweet Briar or Eglantine, for this unique exhibition as I wanted to celebrate this beautiful ancient hedgerow plant, a fragment of a landscape dating back over a thousand years which is now lost to us. I am fortunate Rosa rubiginosa grows in a hedge along a footpath near to my home in West Suffolk. 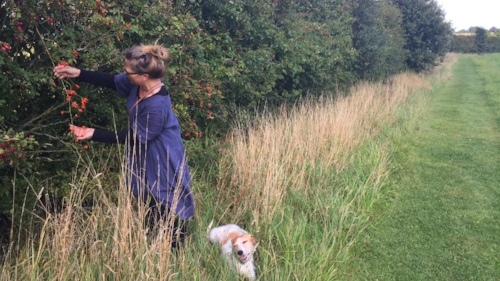 I have closely observed its seasonal transformations as it intertwines with its thorny companions Blackthorn and Hawthorn, during my daily walks with my lurcher, Tilly. Rosa rubiginosa forms part of an endangered wildlife habitat. Hedgerows are ecologically important for food, shelter and nesting cover for a wide range of species. Hedges provide connecting habitat corridors within the landscape, which might otherwise become fragmented with sites becoming increasingly isolated. Sweet Briar is a vital early nectar source in spring while later in the year the rosehips are food for many birds and small mammals. 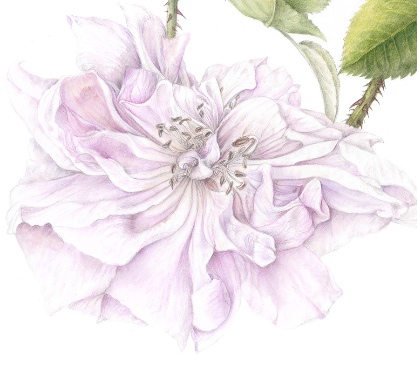 This painting is from a body of work where I am exploring aspects of different roses including the fragrant Rosa damascena and Rosa Chandos Beauty. The rose for me appears to hover between the earth and air elements and has a fascinating medicinal, personal, social and historical symbolic potency. I use rose seed oil as the base oil in a moisturiser, which I then mix with essential oils. The seed oil is very rich in vitamin E plus many other vitamins, minerals and essential fatty acids, which together make a lovely nourishing oil. My creative process is often a multi-layered response including cultural, environmental, medicinal, symbolic and spiritual considerations. Some subjects have over time developed a personal symbolism, boundaries and edges or how things meet being one such example. Both formally and as a narrative, this has informed my painting. I began by spending time on meticulous observations, using various Plant Observation techniques. I then made lots of graphite pencil drawings and gradually the composition started to evolve. I used a new paper, a Hot Pressed watercolour paper called ‘Moulin du Roy’, which had its challenges but does have a lovely smooth surface. 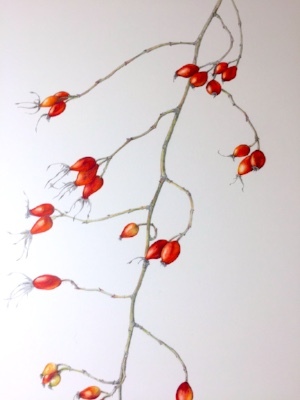 In this piece I have focused on Rosa rubiginosa’s interesting branch structure. Inspired by its wayward growth habit I have depicted the branches as both hanging down and reaching skyward as they stretch up above the hedgerow. Relishing the rich, vibrant colours and forms of the autumn hips, I hope I have also conveyed the way they seem to quietly communicate with each other. I will be at the Gallery helping to steward the show on Saturday 19th May. Paintings and late medieval woodcuts of nearly 200 plants in the College’s Medicinal Garden, with contemporary uses; full list of plants used in the Pharmacopoea with modern names, and directory of the artists. It is a huge privilege to be part of the publication of a limited edition contemporary 'Herbal'. I am very interested in Herbals and Nicholas Culpepper is a 'hero' of mine. August 20th - 30th 2018 at the Royal College of Physicians in London. The Pharmacopoeia Londinensis was originally published in Latin by the Royal College of Physicians in 1618 and translated into English by Nicholas Culpepper in the middle of the seventeenth century. Now to celebrate its 400th anniversary an illustrated version of the book is to be published later this year. I am delighted to be one of a number of contemporary botanical artists asked to contribute to this exciting project. I have selected to paint the beautiful and intriguing ‘Rosa damascena’ or the damask rose. A strongly scented rose it is famous for its use in perfume with the fresh petals either distilled as rose water or as one of the worlds most expensive essential oils, 100ml costs more than £1500.00, the petals are also used dried and the hips used fresh or dried. Rosa damascena essential oil is composed of hundreds of components, including citronellol, citral, carvone, citronellyl acetate, eugenol, ethanol, farnesol, stearpoten, methyl eugenol, nerol, nonanol, nonanal, phenylacetaldehyde, phenylmethyl acetate, and phenyl geraniol. There is evidence of its use medicinally going back to the seventh century with a particular link to Iran and the Middle East. Recent studies of the pharmacological effects of the damask rose show it has not only antibacterial and anti oxidant effects, but also anti-viral, anti-depressant, anti-diabetic, analgesic and hypnotic properties. The Illustrated College Herbal features paintings and late medieval woodcuts of nearly 200 plants from the Pharmacopoea Londinensis beds in the RCP’s Medicinal Garden. Authors Jane Knowles, Henry Oakeley and Gillian Barlow pay tribute to Britain’s rst pharmacopoeia, breathing new life into the history of medical botany with beautiful artwork from dozens of distinguished artists. The RCP garden in 2012–2013, commissioned the paintings from artists in the Chelsea Physic Garden Florilegium Society, the Hampton Court Florilegium Society and others, and we are grateful to them all. All through the spring, summer and autumn a steady stream of artists visited the RCP to collect plants so they could paint from life. They have allowed us to follow in the tradition of the great illustrated herbals of Leonard Fuchs (1542), Jean Ruellius (1543 et seq), Petrus Matthiolus (1554 et seq), Rembert Dodoens (1554, 1583), William Turner (1561–68), Henry Lyte (1578), John Gerard (1597, 1633), John Parkinson (1640), Elizabeth Blackwell (1737) and the Medical Botany of William Woodville (1790). These works had beautiful line drawings, woodcuts and engravings, and while The Illustrated College Herbal pays tribute to the incomparable woodcuts of Matthiolus, none had watercolours or drawings to match those of our artists. The book contains a brief history of the origins of the Pharmacopoea Londinensis,a glossary of long-forgotten medical terms, and a bibliography of the literature consulted. It contains a directory of all the artists with their career and contact details. The original paintings and limited edition prints will be available to purchase from the artists and will be exhibited in the Council Chamber at the RCP in London from 20–31 August 2018. The paintings are beautiful and the woodcuts a reminder of the skills of our predecessors. As a source of pleasure, of source literature, as a commemoration of one of the RCP’s most important achievements in half a millennium of existence and as a unique reference book or elegant coffee-table decoration, we commend it to you. via garden@rcplondon.ac.uk (please put ‘Illustrated College Herbal’ in the subject line, and your address in the text of the email) or via publications@rcplondon. ac.uk. £20 + p&p. With this book, the gardeners and the garden fellows of the Medicinal Garden of the Royal College of Physicians of London celebrate our 500th anniversary and the 400th anniversary of the publication of the Pharmacopoea (sic) Londinensis by the college. This was produced to provide the Worshipful Society of Apothecaries, newly formed in November 1617, with a single, simple standard for the formulation of medicines, rather than the plethora of different pharmacopoeias then available. It was the first pharmacopoeia which, by edict of King James I, had to be used by a whole country, not just a city, anywhere in the world, and the most important publication by the college in its rst century of existence, and one which continues – as the British Pharmacopoeia – to this day. The Illustrated College Herbal is a beautiful book with 118 paintings and drawings donated by 80 of the best botanical artists of our era, and 77 woodcuts from the folios of the greatest publisher of herbals in the 16th century. The Pharmacopoeia Londinensis contained 430 compound medicines, and a list of the plants, minerals and animal ingredients which were used to make them. There are 774 ingredients listed, of which 634 are plants and 140 are minerals or animal products. The plant names are in contemporary Latin, and are often duplicated, with different spellings or synonyms and represent about 380 different plants, listed according to which part (eg roots, leaves, sap, etc) was used. Around 200 are now grown in the RCP’s Medicinal Garden in the unique Pharmacopoea Londinensis beds, researched, designed and planted by head gardener Jane Knowles along St Andrews Place. These, a living 17th-century medical chest, are illustrated and their uses described, in The Illustrated College Herbal. Jane Knowles has translated the nomenclature of all the plants from their archaic pre-Linnean names to those by which they are now known internationally, a unique reference source for all interested in the history of botany and medicine. The 17th-century uses of each plant have been provided from the synoptic descriptions of Nicholas Culpeper as given in his translation of the pharmacopoeia,A Physicall Directory (1649), and by other more erudite authors when Culpeper is insufficient. The medical notes which accompany each plant re inact an era when a migratory uterus (referred to as ‘dislocation of the matrix’ and ‘suffocation of the mother’) could cause choking, breathlessness and hysterical aflictions. The humoural therapies of Hippocrates and Galen held sway, and plants were judged as hot or cold, dry or wet, or effective in abolishing the choleric humour and expelling the black melancholic humour in order to restore the imbalance of humours which was believed to be the cause of illness. Only a few years before Harvey’s De Motu Cordis, our predecessors had believed for nearly 2,000 years that blood was manufactured continuously in the liver and delivered to the body via the veins, and that air from the lungs passed through the solid interventricular septum to be distributed to the peripheries in the arteries. Remnants of the Doctrine of Signatures persisted, with yellow flowers and three-lobed leaves being regarded as good for jaundice and liver disorders. The Illustrated College Herbal reminds us how far we have come, and is a salutary reminder that our successors may regard our current beliefs and practices with similar perplexity. 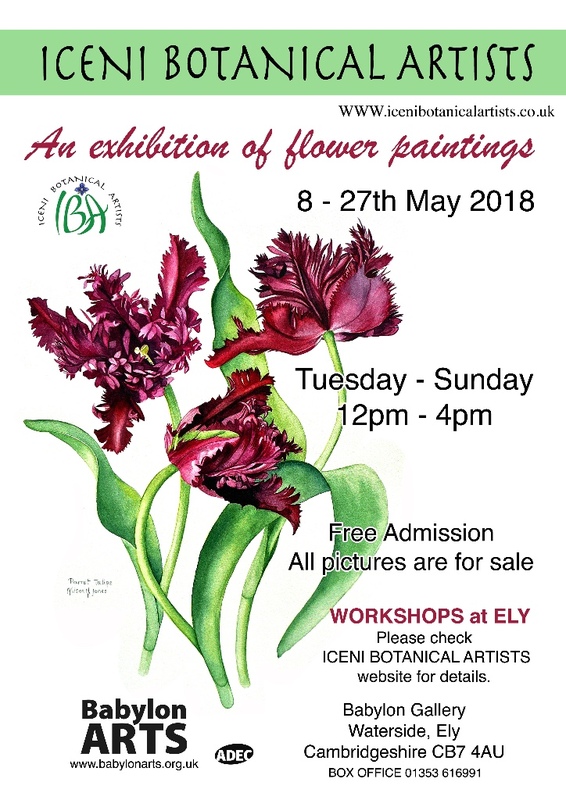 Delighted to be exhibiting for the first time with this East Anglian based group of Botanical Artists. the very lovely 'Peacocks' tearoom nearby ! thank you to Rachel at Maihen Bespoke Picture Framing in Kent, and to Kevin and Jo at Wildwood Picture Framing in Suffolk. I would highly recommend them both, and as some of you know I am very fussy ! 18th April - 22nd July. I am really looking forward to seeing this, more info from their website. As some of you may know Cedric lived in Suffolk and bred many beautiful Iris cultivars, I am one of the group of contemporary botanical artists in the Cedric Morris Florilegium painting these beautiful flowers. But more about that another time ! Hard at work finishing my painting for the Bedgebury Florilegium Society Exhibition at the Artichoke Gallery in Ticehurst. One of the cones collected when a team from Bedgebury embarked on a three week collaborative seed collecting expedition along the whole of the Pacific Northwest of the USA last September. Their goal was to gather wild seed from some of the tallest, largest and rarest trees on the planet. a weekly radio programme on Channel Radio about Arts and Culture in Kent. There will be four week excavation to tie up loose ends this summer, the dig will be a smaller scale this year, but it should help to answer the remaining research questions. Site Tours are on Saturdays at 2pm. I am observing the tree and making drawings throughout the year working towards a final piece for the florilegiums collection. The Florilegium work in partnersgip with the Friends of Bedgebury, the Forestry Commission and the Dendrologist Dan Luscombe. The objectives are to represent creatively the rarity and diversity of the tree collection. This drawing shows the pattern of the river Nailbourne, the blue line, from its beginnings at Lyminge down to the sea. The concentric circles were inspired by glass trails found on Anglo - Saxon cone beakers and from the extensive glass fragment assemblage and glass grave goods excavated at Lyminge. There are 43 circles, each one representing one generation, so the drawing reflects on the time between now and the 5th century AD. The patterns made by the reflected watercourse hint at the intricate designs used in Anglo Saxon metalwork whilst the cross references the later monastic importance of Lyminge. I have become interested by the glass shards and how these fragments seem to represent the lost narratives of the Anglo Saxons. Another drawing from this body of work is in the gallery page. The village of Lyminge in Kent is a very rare and important archaeological site. 1,300years ago, an Anglo-Saxon monastery stood in the village, presided over by a royal abbess. Excavations are now showing that Lyminge was an improtant place before this, with evidence for a long sequence of Anglo-Saxon occupation extending back into the 5th century A.D. Archaeologists from the University of Reading, along with local volunteers, archaeological societies and university students are working here each summer to uncover this `Anglo-Saxon past.